While everyone was in agreement about the crisis in higher education, no-one was able to say what should be done now. Trinity College Dublin Students’ Union’s general election party debate saw representatives from almost every party in Ireland come to Trinity, representatives who had come to engage with the audience on issues relating to higher education in advance of the upcoming general election. However, as topical issues such as funding, accommodation and student loans were discussed, one could come away believing that it really didn’t matter who you vote for. Every party present lamented the underfunding of the higher education system. Every party present acknowledged the student housing crisis. Every party present said that they opposed the introduction of fees and every party present stated that they believed education was an essential good in our society. The problem was that no-one took ownership. Every party that had previously been in power highlighted the good that their party had done to support third-level education in Ireland, but no-one – except Labour’s Aodhán Ó Ríordáin, who apologised for Labour’s break of their 2011 promise not to increase the student maintenance fee – acknowledged the mistakes that they had made that lead to the current funding shortfall. And this was the true problem with tonight’s debate: no-one spoke for the government. It is universally acknowledged that the arguments and the policies put forward by an opposition party are more attractive. It’s also true that a debate isn’t much of a debate when no-one can defend their actions. As such, while the event was interesting, engaging and extremely worthwhile, it was missing much of the sense that what we were talking about really mattered in an immediate sense. As parties asserted what they would have done differently or what they would like to do in the long term, no-one was able to argue what we needed to do right now, and no-one was there in power to direct that question at. The issue, then, was with who the parties decided to send. While Fianna Fáil, the Social Democrats, Renua and the Green Party all sent party leaders, Fine Gael sent former junior minister Ciarán Cannon and Labour’s representative, a current junior minister, had to leave after his opening remarks. Fine Gael were also the last party to confirm their attendance. It was the as-of-yet untested parties that managed to win the evening. 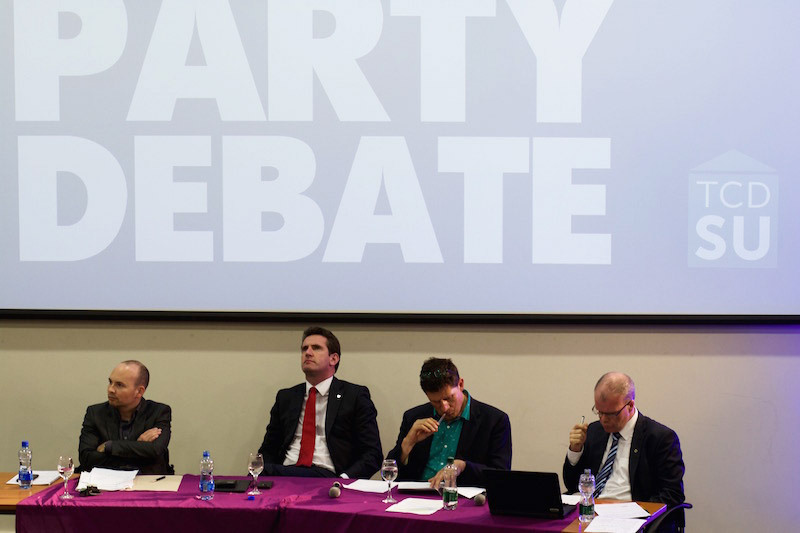 Stephen Donnelly of the Social Democrats got arguably the largest cheer of the night after his opening remarks, in which he launched an attack on the current funding model, highlighting that, in the recent budget: “Higher education, all of you, got zero. Not one cent of that €1.5 billion was allocated to third-level education.” Creighton gave a straightforward account of her party’s policies, refreshingly unafraid to put forward ideas that the crowd may not automatically agree with. The Anti-Austerity Alliance’s Paul Murphy was resolute in his beliefs about the value of education, calling for a movement that reflected the desire of students. Much of the night can be summed up by an exchange between Renua’s Creighton and Fine Gael’s Cannon. On the topic of higher education funding, Creighton argued that the sector needs to be funded through “a combination of factors” – namely state funding, private funding and general innovation. Cannon, the only representative of the government still there at that point, claimed to agree, but did not commit to any particular funding model, nor any sort of government funding. Instead, he stated: “We need to be creative”. Ultimately, every party addressed serious questions with clarity, and anyone present would be satisfied to learn that each party is aware of the problems facing higher education. However, when everyone is speaking from the opposition, and when when no-one who can actually influence current policy making is engaging, it’s hard to know if anyone has said much at all.